Our friends at Hawaiian have just released a video time-lapse of the painting of their very first ATR. Whilst we announced this a while ago, secretly we’ve been waiting for the chance to see this livery for real. The new aircraft are absolutely stunning and are yet another winning livery for the pacific – which seems to be the hotbed of good liveries (Hat-tip to Fiji Airways). 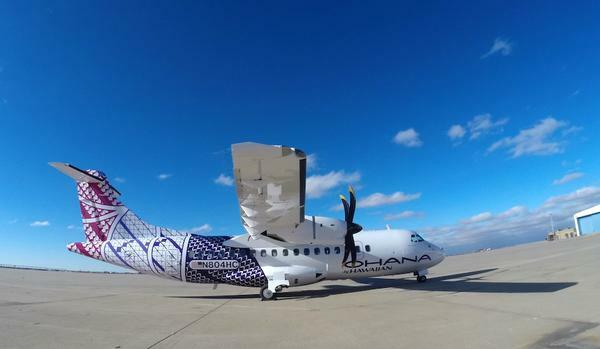 The latest livery, by Hawaiian artist Sig Zane and son Kuha’o is a complicated masterpiece which showcases the route network of the island along with interpretations of traditional pacific island graphic prints. The livery will be a welcome addition to the isles, although we have to say, the registration bubble on the rear of the aircraft annoys us a little bit (as I am sure it will the designer) Whilst it has to be there, and there isn’t much that can be done about it, as it has to be legible, seems like a sore thumb on an elegant design. Perhaps removing the purple outline to the bubble would have been a more subtle way of placing the registration – or placing it on the lighter area of the design. We are headed out to Hawaii next month, and will try to get some more pics and information. In the meantime, what do you think of the new livery? Pingback: Hawaiian Airlines Shows Off Its New Interiors - HotelsFlash - All About Hotel News! I love the story behind the work, the individual elements, the artists, the colours and how it fits together in theory. But as a part Hawaiian originally from Hawaii, to me it looks too busy and all over the place when put together on the fuselage. To me, simple, elegant with enough detail to make it memorable is always the right strategy.